BATV (Bounce Address Tag Validation) is a way of confirming that bounce messages you receive are really due to messages you sent. It is trivial for email senders to specify any email address they wish as the address that the message came from. This means that spammers often send emails from legitimate email addresses even though they have no right to use that sender address. This will usually cause the owner of that email address to receive a storm of bounce messages from messages they didn't actually send. BATV helps to alleviate that problem. What it does is change the Return Path email address on outgoing messages in a certain way (the Return Path address is where bounce messages are sent). Then, when bounce messages are received, the address that the bounce message is sent to can be verified to confirm that it was modified in the correct way. 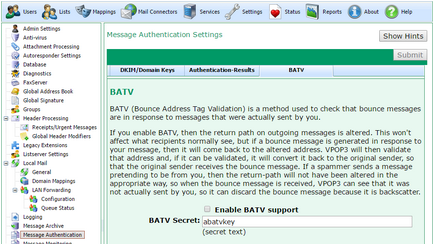 The Enable BATV support option turns on BATV address modification and verification. The BATV Secret value sets the secret value used when generating the BATV tag. When you use BATV, if you send a message from user@example.com, then Return Path will be modified to something like prvs=<tagvalue>=user@example.com. This means that the original Return Path can easily be seen, but the prvs=<tagvalue> prefix indicates that it has had BATV applied to it. The value of <tagvalue> is calculated based on the BATV Secret, a timestamp and the original Return Path. •BATV can sometimes cause problems if you are sending messages through an ISP which verifies sender email addresses, because the modified email addresses may not be understood by the ISP so the messages may be rejected. •If your incoming mail is received through a third party (eg a filtering company) which checks email addresses, they may reject the bounce messages because they do not recognise the recipient. Also, this type of company may perform their own BATV checks on incoming messages, but they may not recognise the way that VPOP3 has modified the Return Path as being the correct way, so they reject the bounce messages. •If you are sending mail through another server which performs BATV as well, then it can cause issues. Many problems with BATV can be alleviated if the other software recognises that the address is a BATV address, so can handle it appropriately because they have a standard format so the original recipient can easily be detected.